wood shop candelabra project at our local thrift store, I thought it would be a fun project. I decided to create a simple candy-abra. First I took the candelabra apart and removed the candle cups. Next it was painted with white chalk paint. I sanded some of the edges to give it a well-loved appearance. 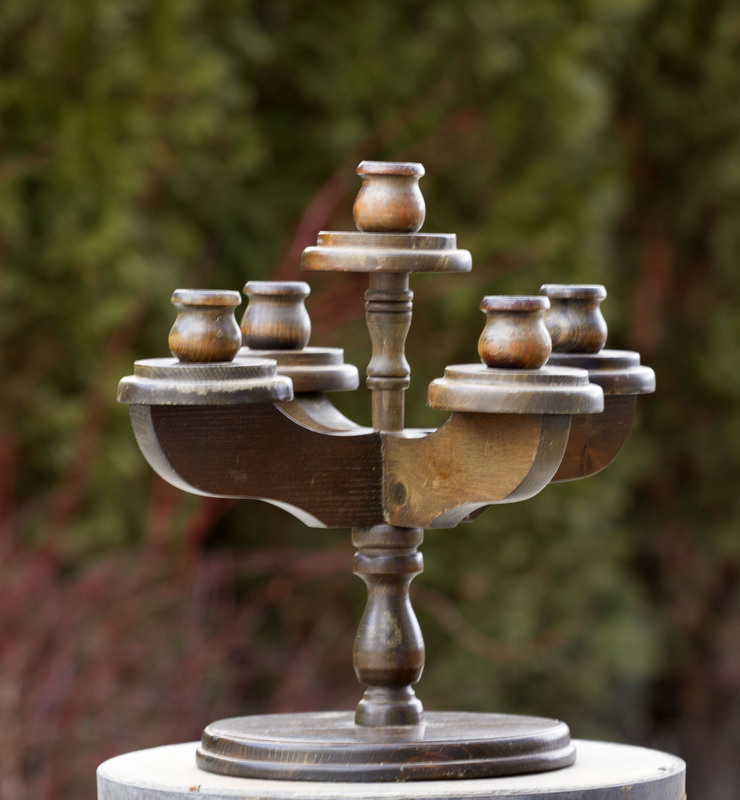 Then I reassembled the candelabra and applied a clear wax as the finishing coat. By removing the candle cups it left a platform to attach glass jars. I used glue dots that can be found in the scrap booking section of craft stores to attach the glass jars so I could remove them and exchange the jars for plates or other containers. The glue dots keep the jars secure yet can be removed. I could take it a step further and attach crystals or garlands of beads. Mason jars would also look great on this stand. 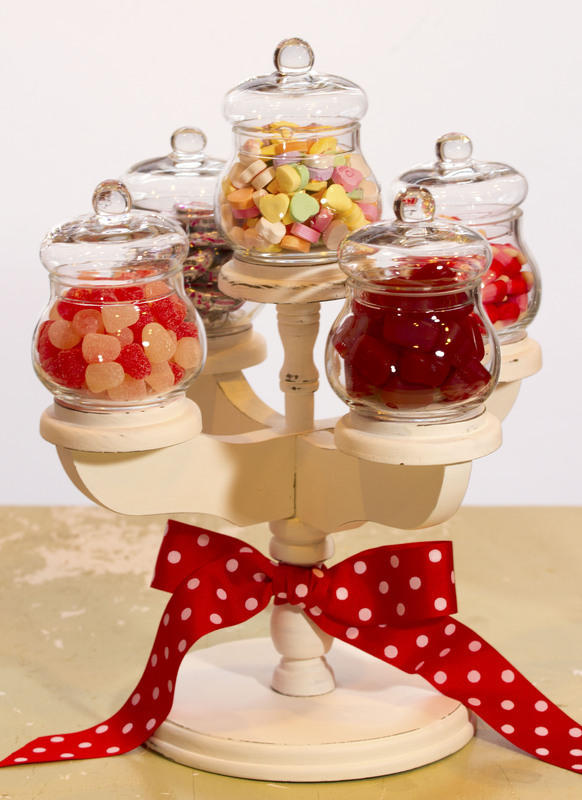 I filled the jars with colorful candy for Valentine’s Day. We have changed our diet to a sugar-free and gluten-free diet but I still like to decorate with pretty seasonal candy. Some other uses for this candy-abra are salad dressings for a buffet, craft supplies, buttons, thread, bath soap and salts, flowers, cotton balls, Q-tips, make-up sponges, fruit, crackers, pretzels, nuts, ice cream toppings, vegetables and dip, cookies, lollipops, sea shells, office supplies, flowers, hot chocolate and marshmallows, flat ware, mini snow globes with artificial snow and bottle brush trees, candles, or miniature ornaments. This piece is perfect for a holiday party table or special occasion, and a creative way to display sweets on a dessert buffet. 06 Feb	This entry was published on February 6, 2014 at 3:43 am. It’s filed under DIY, Holidays at the Cottage, Re-purpose, Re-purpose Gallery, Tutorials and tagged candelabra, candy, re-purpose, re-purposing, up-cycle, up-cycling, Valentine's Day, Valentine's Day Decorations. Bookmark the permalink. Follow any comments here with the RSS feed for this post. I love this! It would make an awesome party table centerpiece! Thank you. I know it will come in handy for many parties.